Another infinity scarf, but this one is for me! I picked up this Mini Mochi yarn last year at a little yarn shop in Santa Fe, and I've had an unfinished project going ever since. This week I focused and finished it up so I could enjoy the colorful striping. 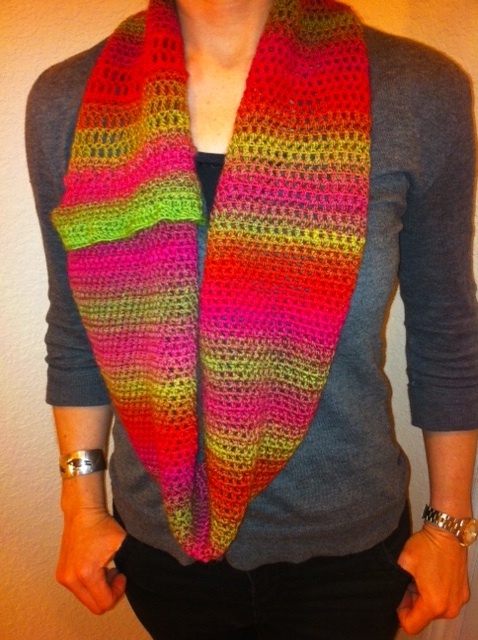 The stitch is mostly just half-double crochet, but if you look closely at the bright green single ruffle on the left side you'll notice a couple of bobble rows, and some treble crochets above that. I adore the greens to reds in this colorway... so perfect for me. 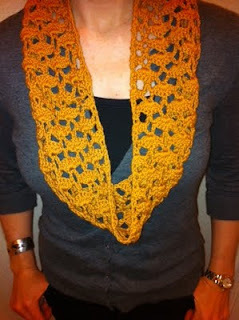 I also wanted to post a new picture of the Pumpkin cowl I finished a couple of weeks ago. This picture gives a more accurate visual of the actual shade of orange. And this little pic had to be thrown in, too. It's one of my new place settings that Mom treated me to when she was in town last week. We headed to Pier 1 and loaded up our baskets with all kinds of goodies. 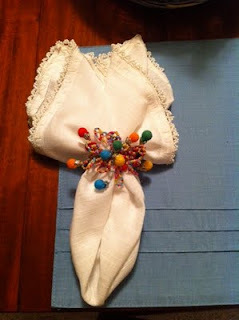 The napkin ring was called Circus and I just couldn't take my eyes off it! I love the little balloons with the bright colors. It was just screaming at me to take a set of them home. So I did. Thanks, Mom!